I’m sorry to say that my obsession with the ethics of enhancement in sport is set to continue for a few more days at least. For some background as to why I’m interested in this topic see here and here. I appreciate some readers may be getting slightly bored with this topic, but today’s post should be pretty useful since it is the first in a two-part series that attempts to provide a broad overview of all the anti-enhancement arguments in sport (but in this case the term “doping” is standing in for “enhancement”). Angela Schneider and Robert Butcher “A Philosophical Overview of the Arguments on Banning Doping in Sport” in Tannjso and Tamburrini (eds) Values in Sport: Elitism, Nationalism, Gender Equality and the Scientific Manufacture of Winners (Taylor and Francis, 2000). In this article, Schneider and Butcher identify three main families of arguments against doping. They are: (i) fairness arguments; (ii) harm arguments; and (iii) integrity arguments. 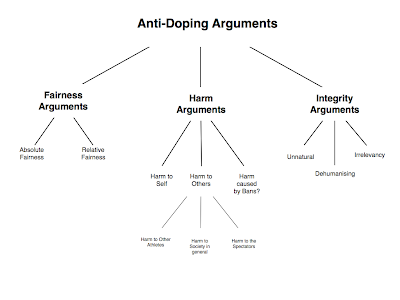 The first group of arguments suggest that a permissive attitude toward doping leads to unfairness; the second group of arguments suggest that a permissive attitude toward doping creates different varieties of harm; and the third group of arguments suggest that a permissive attitude toward doping somehow perverts or undermines the integrity of the sport. Within each of these groups there are a number of different arguments to be considered. I have presented these in the diagram below. Over the course of the next two posts I will try to examine most of these arguments, using Schneider and Butcher’s analysis as my guide. I will, however, be excluding the fairness arguments from my discussion. I do so since I have already considered these kinds of arguments at length elsewhere. 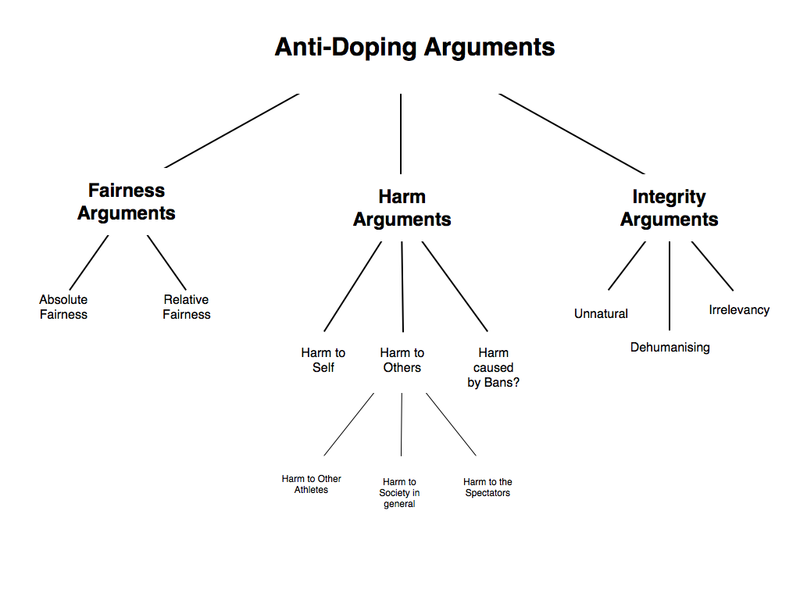 In the remainder of this post, I will look at the various harm-based arguments against doping. Three quick points at the outset. 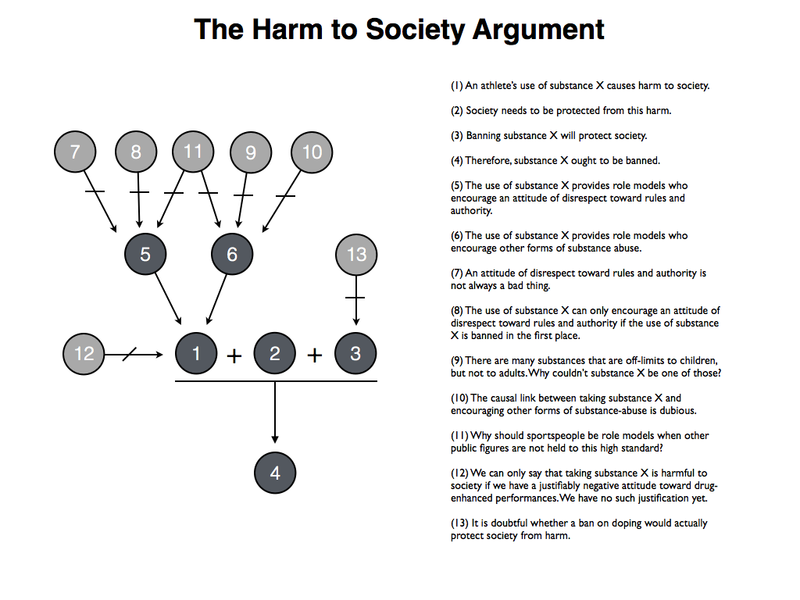 First, “harm” is generally agreed to be a morally relevant consideration, particularly in liberal political theories. Second, “harm” is obviously an ambiguous concept. 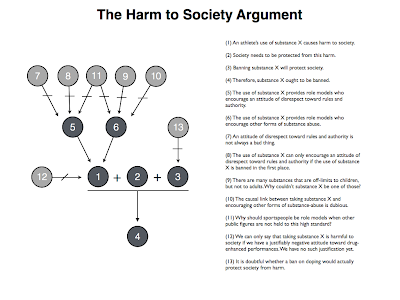 This needs to be borne in mind when reading the remainder of this post: the arguments that we are about to discuss may all appeal to different forms of harm. And third, because of the (ambiguous) nature of harm, there can really be no general harm-based argument against doping. What matters is whether a particular form of doping is harmful in a particular sport. This needs to be assessed on a case-by-case basis. Schneider and Butcher overcome this problem by using some case studies in their analysis. I’ll mention these as I go along. 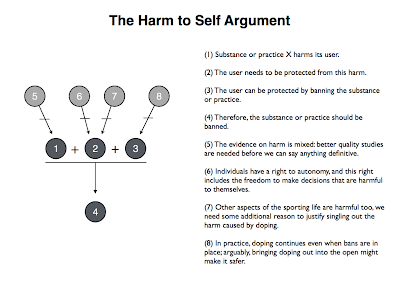 (1) Substance or practice X harms its user. (2) The user needs to be protected from this harm. (3) The user can be protected by banning the substance or practice. (4) Therefore, the substance or practice should be banned. They then imagine this argument being used to justify a ban on the use of anabolic steroids in sport. Would the argument be successful? As regards premise (1), Schneider and Butcher note that the evidence is mixed. One reason for the evidence being mixed is that the substance is controversial and so difficult to study in a controlled scientific manner (mainly because ethics committees tend to reject proper studies). Controlled trials using low doses seem to reveal that there is little harm, but anecdotal evidence amongst athletes using high doses suggest some potentially harmful side-effects. (5) The evidence on harm is mixed: better quality studies are needed before we can say anything definitive. So people who wish to use the harm argument will — somewhat paradoxically — need to encourage further studies if they are to justify premise (1). Whatever the reality may be, Schneider and Butcher are willing to concede the truth of premise (1) since they think the main problem with the argument lies in premise (2). And what might this problem be? The answer, in a word, is paternalism. It is generally accepted — following the lead of J.S. Mill — that paternalism is unacceptable in a liberal society. Competent adults have a right to autonomy and the right to autonomy encompasses the right to make decisions that go against one’s interests. Since professional athletes are usually competent adults, it follows that we shouldn’t intervene to prevent them from taking a potentially harmful substance. To be sure, this argument isn’t completely compelling: paternalism can be acceptable in some instances. For instance, Schneider and Butcher suggest that a paternalistic attitude toward child athletes might be acceptable. They just don’t think such an exception from general rule applies to competent adult athletes. There are other problems with premise (2). The chief one being that many sporting activities and training practices are harmful as well and yet we don’t ban people from participating in them. Take boxing as an example: to be a boxer means that one takes on certain risks associated with the sport. Since we don’t step in to prevent people from voluntarily competing in this potentially harmful activity, how could we justify stepping in to prevent people from taking a potentially harmful drug? (6) Individuals have a right to autonomy, and this right includes the freedom to make decisions that are harmful to themselves. (7) Other aspects of the sporting life are harmful too, we need some additional reason to justify singling out the harm caused by doping. Premise (3) is also in trouble. Schneider and Butcher argue that there is very little evidence to suggest that banning the use of a substance actually protects athletes. Indeed, despite the fact that anabolic steroids are banned in many sports, athletes continue to take them in “clandestine, unsanitary and uncontrolled ways”. Other steps are probably more effective in weening athletes away from steroids, steps which Schneider and Butcher return to later in the article. (8) In practice, doping continues even when bans are in place; arguably, bringing doping out into the open might make it safer. The argument map below summarises the reasoning to this point. The overall conclusion is that the harm to self argument seems like a non-starter. On the face of it, a harm-to-others arguments is far more likely to succeed than a harm-to-self argument. The reason goes back to the core of Millian liberalism: the harm principle. Although it is wrong to stop someone from harming themselves, it is right to intervene and stop them from harming others. Thus, as we switch to consider the harm-to-other athletes argument, things are looking up from proponents of the doping ban. 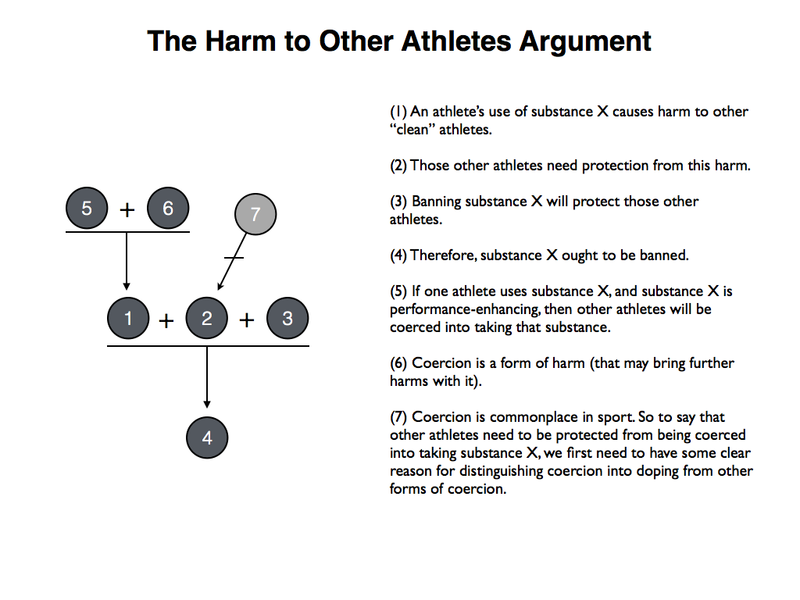 (1) An athlete’s use of substance X causes harm to other “clean” athletes. (2) Those other athletes need protection from this harm. (3) Banning substance X will protect those other athletes. (4) Therefore, substance X ought to be banned. What are we to say about this? Well, first things first, we need to some clear grasp on the nature of the “harm” that is thought to arise here. Schneider and Butcher suggest the harm of coercion is the main one, with coercion then bringing further harmful effects if the substance itself turns out to be harmful in some way. In other words, the following two premises support premise (1). 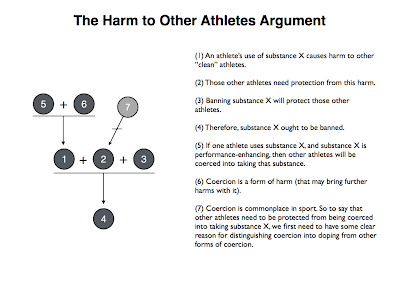 (5) If one athlete uses substance X, and substance X is performance-enhancing, then other athletes will be coerced into taking that substance. (6) Coercion is a form of harm (that may bring further harms with it). The problem Schneider and Butcher then see with the argument is that the harm of coercion is commonplace in sport. For example, if one athlete takes up a new (potentially harmful) training regime, and this training regime proves highly successful, then other athletes will be forced to follow suit. In some ways, that’s just the nature of the beast in competitive sports. There is an arms race logic that prevails. In order to stay competitive, athletes will need to up the ante, and once they do this others will have to up the ante too. This process can cycle on indefinitely. So the question for Schneider and Butcher then becomes: why is upping the ante by adopting some new training regime less objectionable than upping the ante by taking steroids (or other drugs)? To answer that question we must move beyond harm-related concerns to concerns about the nature of doping and the nature of sporting excellence. In other words, premise (2) of the argument is hopelessly incomplete. (7) Coercion is commonplace in sport. So to say that other athletes need to be protected from being coerced into taking substance X, we first need to have some clear reason for distinguishing coercion into doping from other forms of coercion. Schneider and Butcher try to find some independent reasons for thinking that coercion into doping is different later in their article, and once they have done this they think a coercion-based objection to doping could become successful. We’ll see how this might work in part two. For now, let’s move on to the next harm-based argument. Argument diagram is below. (1) An athlete’s use of substance X causes harm to society. (2) Society needs to be protected from this harm. (3) Banning substance X will protect society. The key to evaluating this argument is, once again, to clarify the kinds of harm to which it appeals. Schneider and Butcher identify two possible ways in which the use of certain drugs in sport might harm society (particularly children, who are the future of society). First, it might harm society by providing role models who encourage an attitude of disrespect toward rules and authority in general. Second, it might harm society by providing role models who encourage other forms of substance-abuse. Let’s take these in turn. (5) The use of substance X provides role models who encourage an attitude of disrespect toward rules and authority. (6) The use of substance X provides role models who encourage other forms of substance abuse. As regards the first kind of harm — that of encouraging disrespect for rules and authority — there are two things that need to be said. The first is that not all forms of disrespect for rules and authority are to be discouraged; the second is that whether taking steroids or other substances does in fact model an attitude of disrespect depends on whether the substances in question are actually banned. If they are not, then taking them cannot model an attitude of disrespect. But this argument is being used to support the introduction of the ban in the first place. Consequently, in its current form, the argument simply begs the question. (7) An attitude of disrespect toward rules and authority is not always a bad thing. (8) The use of substance X can only encourage an attitude of disrespect toward rules and authority if the use of substance X is banned in the first place. As regards the second kind of harm — that of encouraging other forms of substance-abuse — Schneider and Butcher say the following. There are many substances (cigarettes and alcohol spring to mind) that are deemed appropriate for adults to take and inappropriate for children. And yet we do not ban adults from taking those substances. Why couldn’t doping substances be among those? The only way a ban could be justified on this kind of ground is if there is something particularly problematic about the doping substances (e.g. if they carried the same addictive effect as heroin), and that doesn’t seem to be the case. Also, the causal link here is probably dubious. (9) There are many substances that are off-limits to children, but not to adults. Why couldn’t substance X be one of those? (10) The causal link between taking substance X and encouraging other forms of substance-abuse is dubious. Although this is probably enough, there are few more problems with this argument. We’ll briefly catalogue a few of these here. One particularly significant problem is the assumption it makes about sport and role models. There are other public figures — e.g. rock stars and actors — who we don’t necessarily expect to provide good role models for others. So why should we expect this of sportspeople? (11) Why should sportspeople be role models when other public figures are not held to this high standard? Some philosophers have (apparently) argued that sports do play a particularly important role in shaping a young person’s worldview. But even if we accept that “sport is different” in this regard, we are then forced to confront another dubious assumption. You see, for the role model argument to really work, we’d need to explain why drug-enhanced performances are something that should not be encouraged, i.e. are things toward which young people should not aspire. Not all drug-enhanced performances are negatively perceived. For instance, drug-induced poetry and music is sometimes commended, or viewed as no better or worse than non-drug induced versions. Why should drug-induced sporting performances be different? The answer to that comes from looking at the integrity of sport, not at the harm it can cause. (12) We can only say that taking substance X is harmful to society if we have a justifiably negative attitude toward drug-enhanced performances. We have no such justification yet. Finally, and more briefly, even if all these criticisms don’t apply, premise (3) would still be questionable. Will introducing a ban really protect society from harm? (13) It is doubtful whether a ban on doping would actually protect society from harm. The argument diagram below summarises all of this. One final group of people who might be able to rustle up a harm-based objection to doping would be the spectators. Schneider and Butcher think that the possibility of there being a sound argument of this type is pretty slim. The main kind of harm caused to spectators is that their aesthetic enjoyment of the sport is somehow reduced or undermined by watching drug-enhanced performances. For example, those who watched Ben Johnson’s infamous 100m victory back in 1988 no doubt felt cheated and disappointed when they subsequently learned that he failed a drugs test. There are two problems here however. First, its not clear that there is any great harm being caused here. Certainly, sporting authorities might be worried if spectators start to turn their backs on a sport due to doping (as may have happened in cycling) but its not clear whether that is a sufficient moral reason to ban doping. Second, the harm to spectators could, arguably, be solved by adopting a pro-doping stance rather than an anti-doping stance. If we allow all competitors to use doping substances this would remove spectator’s concerns about unfair victories and might even make the sport more exciting. Thus, it seems unlikely that the harm to spectators argument will ever be compelling. We won’t bother with a diagram here since this is relatively uninteresting. 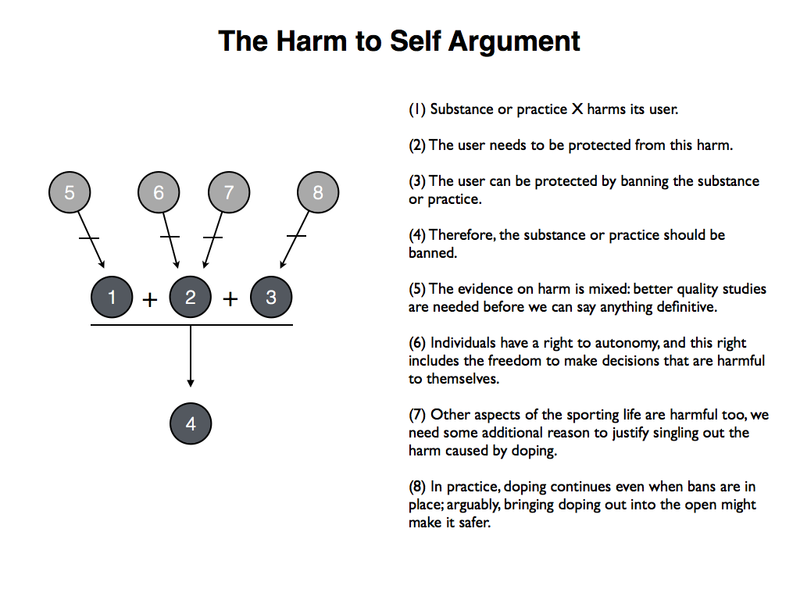 To this point we have been looking at harm-based arguments that support the ban on doping. But harm-based arguments are implicitly consequentialist in nature. And since consequentialism aims at the best overall outcome, there is a flipside that needs to considered here, namely: would a ban on doping cause significant harms that could be avoided by adopting a permissive attitude toward doping? Schneider and Butcher think that there is one major harm that is caused by bans on doping. This is the harm that it does to a person’s right to privacy. It is widely-known that the only effective way in which to police a ban on doping is to have random, year-round drug tests. Such tests are needed since banned substances can be taken in the off season and still benefit the athlete. But such tests mean that the athlete constantly faces the prospect of a random drug test. This is a massive intrusion into the athlete’s private life. (1) Athletes have a right to enjoy private lives. (2) A ban on doping would have to be enforced with a regime of year-round, randomised drug tests. (3) A regime of year-round, randomised drug tests would violate an athlete’s right to privacy. (4) Therefore, a ban on doping would violate an athlete’s right to privacy. Schneider and Butcher see one major objection to their argument being made by proponents of the bans. This is that athlete’s somehow lose their right to privacy by becoming professional athletes. This would presumably be because they don’t have a right to compete in professional sports in the first place, and so when they enter the domain of professional sports they enter a domain that is excluded from the general class of rights. (5) The domain of professional sports is excluded from the general requirements of rights-based societies. Professional sportspeople lose their right to privacy when they enter that domain, and they have no “right” to enter that domain in the first place. Schneider and Butcher see two problems with this objection. First, if taken seriously, this kind of objection would seem to imply that sporting authorities are entitled to introduce all sorts of rights-violating rules. That is surely absurd. Second, if the objection is to avoid absurd implications, it must show why violating the right to privacy in this particular manner is permissible, but other forms of rights violation are not. In other words, it must show why doping is so morally objectionable that it justifies the violation. This justification is something we are still looking for. (6) It is absurd to exclude the domain of professional sports from all the requirements of rights-based societies. (7) In order to prevent the absurd implications of this principle, we’d need some additional reason for thinking that violating the right to privacy was justified in the case of doping, but that other forms of rights-violation could not be justified on similar grounds. The relevant diagram for this is below. We have now run through all the major harm-based arguments in favour of (and against!) doping bans. As we have seen, none of these arguments is particularly persuasive. The harm to self argument is both in need of some hard evidence and in danger of being overly paternalistic. And the various harm to others arguments all fail to explain why doping is so harmful. In fact, they all tend to beg the question, in the technical sense of that term. Furthermore, there is a least one harm-based argument against doping bans. In light of this, we must deem harm-based arguments against doping to be a failure. Perhaps the integrity-based arguments will fair better. We’ll find out in part two.